Planning a road trip through the Australian outback? Tips and inspiration here! These days, the word epic can be, in my opinion, a little over-used. I blame TV reality programs for most of the over used words in today’s vocabulary. Not that I watch them, but you sometimes can’t miss the advertisements. Journey is another one. But, when it comes to this trip, epic is really the first word that truly springs to my mind. As you read it, I’m sure you will agree, and will have a number of other equally impressive words that could easily be used as decriptors by the time you’re done. Matt Williams from Matt Williams Photography recently completed a 9.5 week Australian adventure, covering an enormous 18,118km across some of this country’s harshest and most remote terrain. With the red dust still clearly visible on his swag, and that wistful look in his eyes a sign that he still wanted to be out there, I sat down with Matt to get him to reflect on some highlights of the trip. Driving through the Australian outback is an enormous undertaking. Why did you want to do this? It’s somewhere that I have always wanted to visit. After being involved in the 4WD industry for over 10 years, and hearing all the stories of travelling through the desert, I knew that I just had to get out there and see it for myself. I’m also an avid camper and 4 wheel driver with an adventurous spirit, who loves nothing more than the wide open spaces. Exploring ones own country is also something that I am very passionate about. The places that I went to on this trip, will never be seen by the majority of the Australian population. 18,118km is a huge distance. What were you travelling in? My wife and I went in a 76 series Land Cruiser Wagon, that was fully equipped and upgraded to meet the daily rigours of travelling through some of the most remote and harsh landscapes this big brown land has to offer. We were like snails, with our home on our backs, carrying everything that we needed for up to weeks at a time, without the luxury of being able to replenish fuel, food and supplies. I imagine there’s not much accommodation out there. So what were your sleeping arrangements? As I just said, we carried everything on our back, or at least the Cruiser’s back. We had our swag on the roof rack, and at the end of every day, we needed to get it down off the rack and set it up. If it looked like it might rain, we had an awning that was mounted off the side of the roof rack that was pretty quick and easy to set up as well. When morning came, we packed it all up and hit the track. You would have seen such incredible sights. I know it’s always hard to pick highlights, but was there one thing you loved the most about the trip? Without a doubt, one of the highlights, because there were many, was our visit to Uluru. To be totally honest with you, before this trip, I didn’t really believe in magic. I know there are some pretty good illusionists out there, but magic? After visiting Uluru, watching sunset, and then watching this big lump of red rock start to glow like there was a fire burning deep inside it, well, it’s just like magic. It really needs to be seen to be believed. It isn’t something that can be described. It needs to be witnessed first hand. Once you visit yourself, you will know what I mean! Now you’re a savvy outdoors and 4WD person, but this is the tough outback. What are the greatest challenges someone may experience on a trip like this? The biggest challenge that anyone may experience on this trip is the isolation. The fact that you are generally so far away from anything! The planning and logistics of a trip like this is not something you can do in a couple of weeks. I spent the best part of four months planning and preparing for this trip. From organising permits from the Traditional Owners (permits to traverse are required for a lot of the tracks we travelled), to working out where we could get fuel, water and supplies, and places where we were going to camp for the night. In the outback, your closest re-supply point may be more than 1000 km away! • Make sure your vehicle is in A+ condition and take spares (belts, hoses, shocks etc). • Make sure you and your passengers are in A+ condition. • Don’t overload your vehicle. • Top up your fuel tanks whenever you can. It’s a long way between service stations out there and you don’t want to run out. • Have good quality Light Truck (LT) Construction tyres, and have two spares. • Ensure you have proper communications. I’m not talking about mobile phones either. The only thing a mobile phone is good for out here is to wake you up for another cracking sunrise! A UHF radio is the minimum, but with a very small working range, these can’t be relied upon in the case of an emergency. A Satphone is a much better option, and can be hired from various outlets. An EPIRB is another item that should be in your 4WD, along with a good quality fire extinguisher. • A full complement of recovery gear is also vital, and really, this gear should never leave your 4WD. • The ability to carry enough water for all occupants is critical. • Last but not least – your camera! You want to be able to take some awesome photos to make all your friends jealous when you get home. Oh yeah, and to post on Instagram! The interior of Australia provided Matt and his insatiable appetite for photos plenty of great content. With around 30,000 images taken during this trip, he looked at me a little strangely when I asked if he could pick some of his highlights. It was a difficult task but he managed to do it. So please, take some time to now pore over the beauty and diversity that is outback Australia. Before I set out on this Epic Aussie Adventure, I wanted, above all else to see one of these little critters. Not being a wildlife photographer, I really had no idea how easy or hard that would be. So, to think that I saw this guy towards the end of only our 3rd day on the road, I was pretty pumped. As it was, I drove straight over the top of him, as he was right in the middle of the track. A quick stop and a grab of my camera, I was lucky that he was exactly where I had seen him. All up, we saw another two on our travels. A windmill at sunset is one of those images that just screams the Aussie bush to me. After a big day on the Canning Stock Route (CSR), the sky exploded with colour at our camp at Well 33 near the aboriginal community of Kunawarritji. Kunawarritji is the only community along the CSR between Billiluna in the north and Wiluna in the south. A distance of around 1700 km. Being a Queenslander (on the east coast of Australia) I don’t get to see the sun drop into the ocean very often. So when we made it all the way to 80 Mile Beach on the west coast, there was no way in the world I was going to miss sunset. We were joined by about another 200 travellers and holiday makers down on the beach as we enjoyed a cold drink before heading back to camp for dinner. 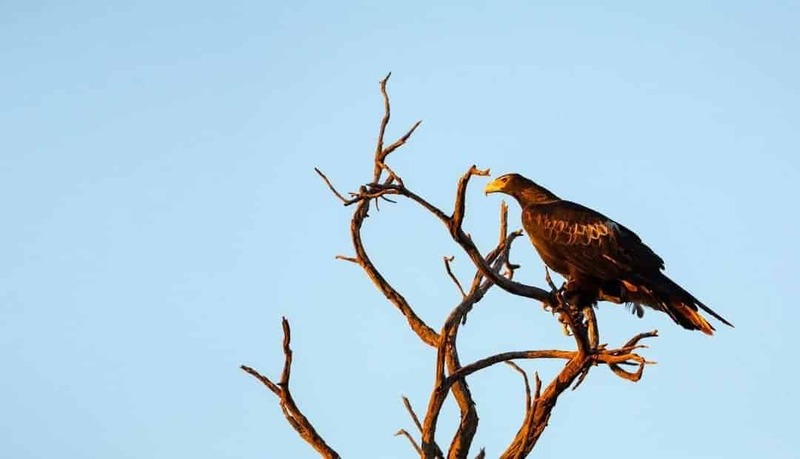 The Wedge-Tailed Eagle is a sight to behold at any time of the day. In the early morning light, perched in an old dead tree – it doesn’t get much better for me. I stalked this guy for about 10 minutes, inching closer and closer before finally spooking him. But it was ok, I got the shot that I wanted. Some of the tracks are so bad in the desert, that after awhile, new tracks are made next to the existing track. This process continues and continues as can be seen here on the Gunbarrel Highway in Western Australia. This highway is notorious for endless corrugations that are so bad that your fillings can fall out! Not to mention the pounding that your vehicle takes. My absolute favourite time of the day. Sunrise. I’ve always been an early riser, so it’s never a hassle for me to get myself out of the swag in anticipation for what the new day holds. Add in some puffy clouds, and I’m in my happy place. This shot was taken on the Connie Sue Highway, just to the south of Warburton, WA. 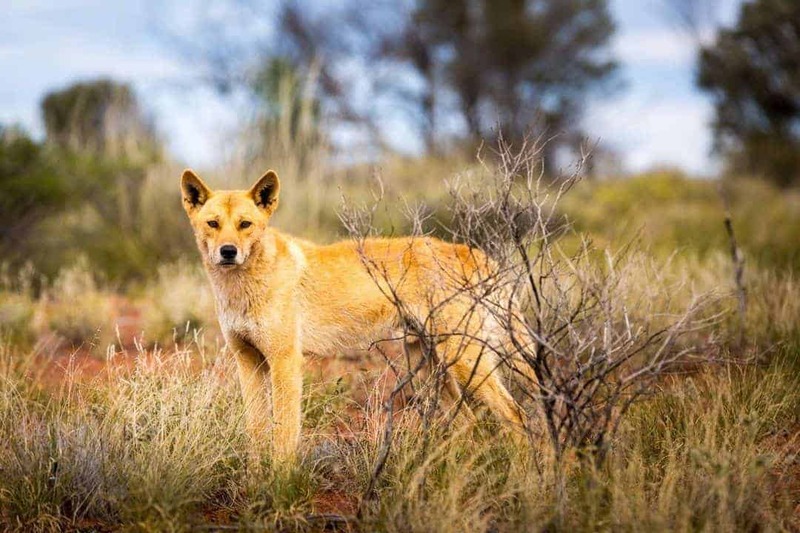 Australia’s apex predator, the dingo, can be found all through the deserts, and can be a somewhat elusive animal to photograph. Thankfully we ran in to this guy. And I mean that literally! Well, we nearly ran in to him. We rounded a tight corner, and there he was right in the middle of the track. After a couple of seconds, he casually moved off the track, heading towards the drivers side. Luckily, I was driving, so I grabbed my camera and fired off a few frames before he headed in to the spinifex. Being a bit of a weather nut (which dovetails nicely with my photography obsession), I couldn’t believe these clouds as we headed south towards Neale Junction, where the Connie Sue and Anne Beadell Highways intersect. It was as though the clouds were trying to mimic the corrugated track we had been driving along all day. The rich red dirt is so very typical of the colour of the soil in the Australian deserts. Apart from seeing all of these wonderful landscapes and amazing wildlife, it wouldn’t have been anywhere near as good if I wasn’t sharing it with my awesome wife. Watching sunrises like this on the Trans Continental Railway Access Track are best shared. Prior to heading away on this trip, I purchased a drone. The different perspective that this device gives me just blows me away. In the South Australian section of the Great Victoria Desert, there grows the most amazing areas of spinifex. These can only truly be appreciated from above, as the plants grow in circular formations from the centre out. Uluru. If you read the story above, you’ll know what I think about this place. And if you thought it couldn’t get any more magical, well a little shooting star just zips across your frame doesn’t it! The dunes of the Simpson Desert just go on forever and ever and ever. Some reports state that there are over 1100 north-south running dunes alone. When you get to the top of one, stop and get out of your 4WD. Regardless of which way you look, there are sand dunes. In the early morning and late afternoon, these dunes typify the colours of Central Australia. Whether you are an Australian or not, one fact will never be argued. The Australian continent is massive, with so much of it virtually inhabitable, and other parts incredibly difficult to live in, or traverse. For those who live in the bush or outback, life is significantly different to the lives lived by those on or in close proximity to the coast. The outback holds a rare and unique beauty, unlike any other part of the world. It’s what interests, intrigues and sometimes frightens Aussies and visitors alike. It’s a land of vast contrasts, tied together with some of the most wonderful people you will ever meet in the world. It’s my home, it’s a home I’m proud of, and it’s the place I always love returning to after any overseas adventure. I haven’t ventured into the outback yet, but I am thankful that I have these stories and Matt’s images to inspire me, and make me wonder, in the meantime. As a child, I learnt this poem by Australian writer, Dorothea Mackellar. Even today, these words still ring true. If these images leave you wanting more, be sure to head over to Matt’s website, Instagram or Facebook page. Note: Matt Williams from “Mattography – Matt Williams Photography” holds the copyright to all images in this article. The images are used in this article with his full permission. Planning a trip to the outback? You’ll need items like this to keep you comfortable. Wow! This is incredible! You’re totally right that this should be labelled as an epic journey. I’ve not yet had the pleasure to go to Australia but have always wanted to (not sure I’m quite tough enough for the outback). The photos in here are fantastic. Matt – considered yourself followed. I’d love to see more interviews like this – complete wanderlust inspiration! Thanks for sharing! Hi Justine, thanks so much for taking the time to read this. I really loved the spirit of the whole piece and I felt like I learned so much from Matt at the same time. I honestly don’t know how he travelled some of it, but if the photos are anything to go by, it was well worth the effort. Amazing! First, I have to say; pictures are incredible! Road-tripping around Australia is probably on everyone’s bucket list and it should be! We need to go back to this part of the world to tick off this item too! A great post. As you said ‘Epic’ like ‘Awesome’ are such overused words, often used to describe something trivial like a cup of coffee. However, we forgive you, Matt’s road trip is truly an ‘EPIC’ experience. The distances are vast and there must be a real sense of how insignificant we are when alone under that big sky. Matt’s pics are excellent, they really capture the spirit of the outback. Thanks Mel and Marcus. I’m pleased you agree as I use the word very carefully. It is a vast country and there is so much isolation out there, only truly understood I imagine when you are out there amongst it all. Yes Matt’s photos are just incredible aren’t they. Epic journey and stunning, vibrant photos. Don’t we just have the most amazing, beautiful country? Pity I have seen only a small portion of it. It sure is Lyn. The great thing is that (hopefully) it will always be there so plenty of time for us to see. The photos are awesome, I agree, He spends so much time looking for the perfect location and shot that it’s great to see him rewarded. We plan to spend a lot more time exploring the middle of Australia over the next few years although our style is a little less rustic with a caravan. Matts photos are an inspiration to get on with it sooner rather than later. Yes I think it’s something that we should all do but I’m with you, as much as I love camping etc, 9 weeks in a swag would do me in. You are right, I can definitely see why the word epic was used. That is exactly how I would describe this! I have always just wanted to jump in my 4wd and go. The photos are amazing and description is great. Makes me want to get in my car and go! Road tripping in Australia sounds like a challenging, yet rewarding experience. I think it’s best that i leave it to the professionals and live vicariously though them. Lol. And the photos are breathtaking!! Ha that’s perhaps a clever choice Livi. That’s an insane amount of land to cover but those photos are unreal. So many of them would be perfect as postcards or framed in my house! I’ve not yet been to Oz but I just had a good friend move there so I’m hoping to make it soon. I hope to leave w/pics like this! It sure is Nathan. That’s why us Aussies don’t have any trouble driving a few thousand kms on trips….we do it all the time. Although this trip is not for the faint hearted! Hope you get to OZ one day, your friend will definitely be an incentive. Such a vast continent indeed hard to do justice to all incredible sights one gets there. I was continuously distracted from reading by the beautiful pics. That’s the way it’s been portrayed, but it’s so much more than that Indrani. Glad you appreciated Matt’s beautiful images. Wow, what gorgeous photos and an amazing road trip – not for the faint of heart I would think!! Down Under is on our list we will save your info for a future trip ! Thanks Stacey, it will be a good source of inspiration for you. 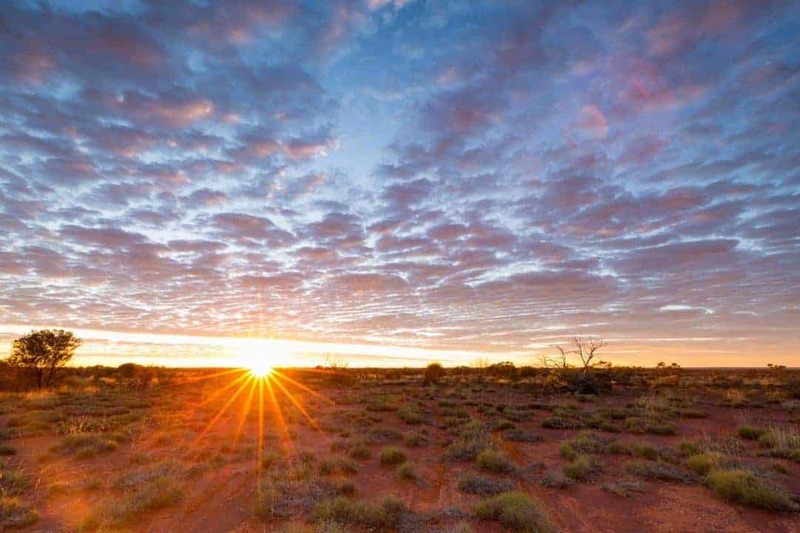 Simply outstanding pictures of the Australian outback. Any person who loves road trips…even those who don’t usually do it, will be tempted after seeing this post. Sounds out of this world. I think out of this world is a great saying for this part of the country. There’s nothing like it ! What an amazing adventure! Hats off to Matt and his wife – they must be a very intrepid couple. I’m not sure I could manage 9.5 weeks but perhaps the Australian outback is addictive? And I don’t need to say that Matt’s photos are incredible. The drone really brings a sense of perspective as to the size of the outback. I’ll definitely check out Matt’s website! Thanks Emily, his work is definitely incredible. And yes, full kudos to them for doing this. 9.5 weeks in that environment is not something I’d probably be itching to do. A smaller trip for me perhaps. Thanks Juliette, his photos are certainly something else. The east coast is most definitely a different type of place to the interior. OMG, though the pictures are stunning, I could never take that much “isolation” as he refers to it. Great post and I certainly will appreciate those pictures much more know understanding what goes into that trip. Thanks Ben, yeah Matt had a serious rig to get through the rigours of this trip. Thanks Elisa, yeah one week I suspect would never be quite enough. Hi Joan, I know they are so amazing aren’t they. If only I could have put more of his fabulous work in here. Check out his website if you want to see more ! Sincerely, this is the most interesting article i have ever read. Excellent photos, words…. and trip. Congratulations!!! One day i want to do all of this. Thank you so much Catarina, I really appreciate that. Hope you can get over here one day too. Such stunning images, this is the kind of trip myself and my husband want to take. We’ve done one trip to the outback to date and tried our best to get a shot of a thorny dragon but no luck! So it’s awesome that Matt got such a fantastic photograph! So glad that he highlighted that the planning and logistics of a trip like this is not something you can do in a couple of weeks. Aus is a really tough country, and you need to be prepared if you’re heading into remote areas for this period of time. Such a rewarding journey though for those willing to go for it! Thanks Meg, The planning was definitely a big task for him, especially where the permits came into play. As is typical with government, there were some fairly onerous processes to go through, and costly too. You also need to be careful of where you can and can’t take photos in a lot of these areas. Hi Pedro, wish I could lay claim to the images but they belong to Matt, the person I interviewed for this piece. But you are right, they are totally amazing. The images are beautiful! Would be hard to disconnect and critters don’t attract me but this place seems worth a visit. Especially those views of the stars. ? It’s not an easy trip I’m sure but well worthwhile. What a trip! Absolutely stunning photography I really envy you making this amazing journey. Again, thank you for sharing this Kerri. What a joy to read, I do like the pictures but reading the words are just simply inspirational. You are right Matt’s adventure was truly an epic one. I cannot begin to imagine the planning, patience and pure luck that came with each photo. Thank you again Kerri. Thanks so much Ralph. It certainly was a mega trip, one not for the faint hearted. My mouth was wide open while reading this – literally jaw dropping! I’m currently doing a pretty awesome Aussie road trip – Melbourne to Darwin via Perth, down the centre to Adelaide and then back up inland SA, NSW and QLD to get to Cairns then back down the coast to Melbourne – but this knocked mine out of the park! It sounds absolutely incredible and I’ll definitely be referring this to any future Aussie outback trips I may embark on! Thanks so much Claire, just went and checked out what you are doing. That is an awesome effort in itself. But yeah, Matt’s trip is just insane!! What a fantastic trip! It is on our to do list but we need to prepare the kids a little bit more before we do a road trip that long. We are starting with a few week trips initially and work our way up to long term. Thanks so much Kell. Sounds like you have plenty of adventures ahead of you. Wow, these photos are gorgeous. My husband is from Australia and talks about the Outback a lot, and the lack of anything there. I don’t know that I’d do a trip like this but definitely to see Uluru which I’ve heard incredible things about.